Meeting friends for breakfast is a favorite pastime of mine. I love hearty breakfast food. I don't eat breakfast very often, which I'm aware is a big no-no, but I love to go out to have a big breakfast or brunch once in a while. 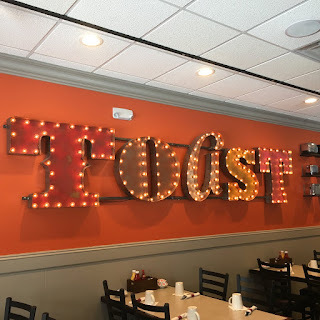 Toast & Jam in Schererville, Indiana has been around for a few months now, but I just finally got around to trying it out. I met up with a couple ladies who I worked with as part of a writing/social media team at a regional newspaper. Changes came at the paper and our freelance positions were eliminated, but we remain friends and get together now every couple months to catch up on what's going on with each other and where our work lives are leading. Working as freelancer, you don't usually get much of a chance to develop friendships with other writers or have traditional co-workers that you work alongside on a regular basis. That's one thing I miss about working in an office is having co-workers to chat and laugh with. I have been writing for some publications for over a decade and have never met the editors I work with face to face. We had a great boss that we worked with who would gather us together to meet and discuss upcoming projects and work goals. I must say, the five of us were a really great creative team who went above and beyond in writing about the positives in our communities and introducing readers to some wonderful people. Anyway, now we're the breakfast team. We decided to stray from our regular spot this month and I'm so glad we did. I had been really itching to try out this new place. Toast and Jam is warm and inviting, yet cool and eclectic. 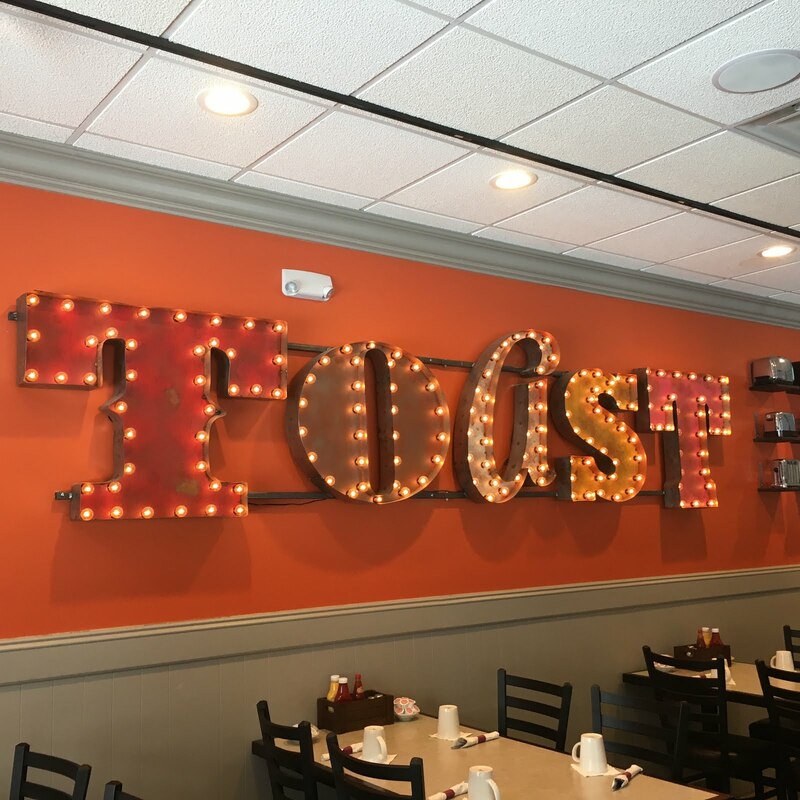 A collection of toasters hangs on the back wall beside a big row of letters bordered with lights that spell out "Toast." The mason jar lights hanging over each booth are adorable. So, on to the food. 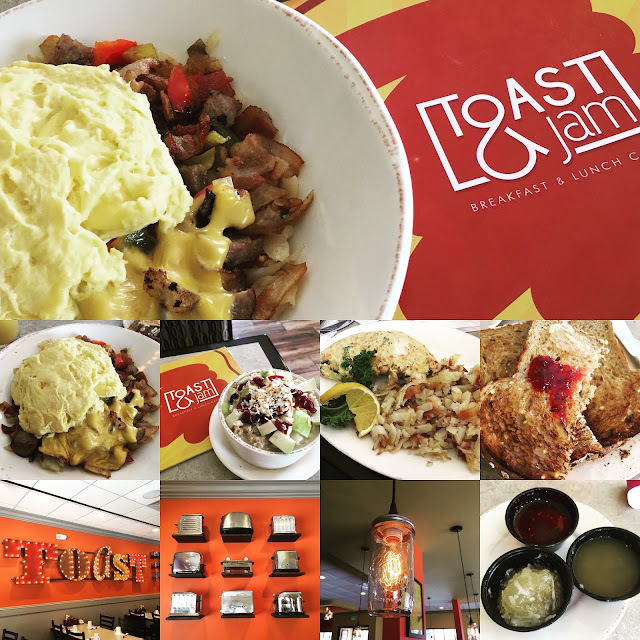 My friend, Diane - bless her heart - was able to peruse the lengthy and enticing menu and order oatmeal, which looked amazing even though I'm not really an oatmeal eater. It was the Healthy Start Oatmeal with toasted coconut, raisins and granny smith apples. 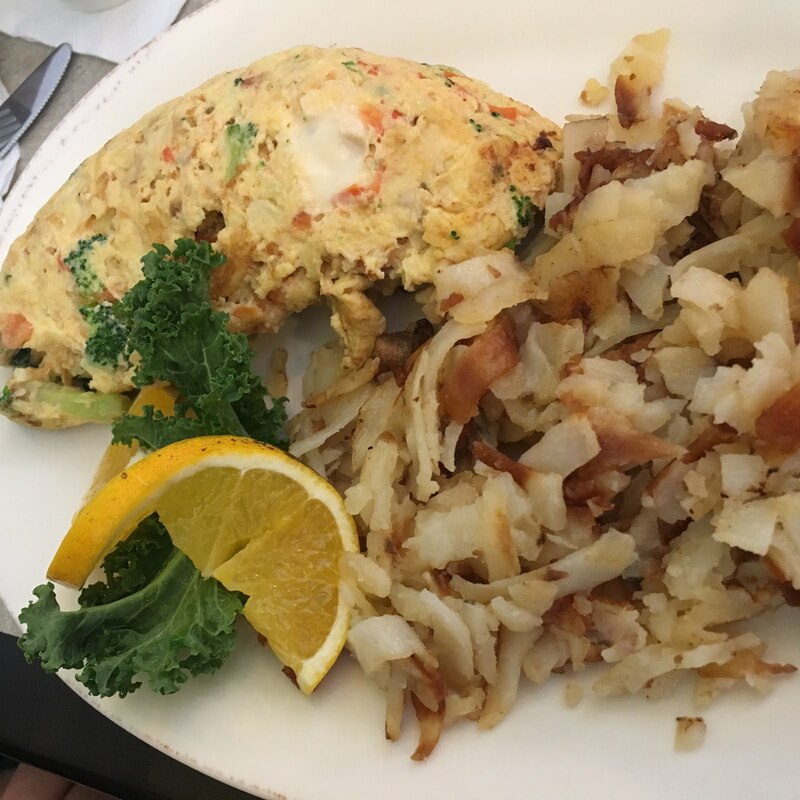 Lesly went with the chicken omelet, which was made with three eggs, grilled chicken, fresh broccoli, spinach, roma tomato and provolone cheese. That's something that's totally up my alley and it looked scrumptious. Me? Well, I opted for a meaty skillet (and that would explain why both of them are a few sizes smaller than I am.) The "Empty Skillet" has smoked bacon, breakfast sausage, onions, bell pepper, American cheese, and hash browns. It came with toast or pancakes and your choice of freshly made jam. I got some whole wheat toast and they offered three different jam flavors. We each got a different one, so I was able to try all three - the mixed berry, the pina colada and the third was an orange variety that I believe was called "dreamsicle." All three were wonderful.